The actions of the Cyprus University of Technology (CUT) research team, as a partner of EPISCOPE aimed, through the monitoring and analysis of a specific building stock to meet the strategic objective of the EPISCOPE project. This is ultimately to improve the energy refurbishment processes in the European housing sector and thus to ensure that the climate protection targets will actually be attained, or that corrective and enhancement actions can be taken in due time, if necessary. The CUT research team for the EPISCOPE pilot action, selected and studied representative buildings from the housing portfolio of the Cyprus Land Development Corporation (CLDC). This is a semi-public corporation obliged to enforce actions regarding the minimum requirements of thermal performance and the energy certification of buildings as defined by the Ministry of Energy, Commerce, Industry and Tourism (MECIT). The Legislation and the Directives of Cyprus follow the EU Directives and they are constantly revised with stricter minimum requirements. In this respect, the MECIT has finalised the minimum energy performance requirements for the nearly Zero Energy Building (Directive 366/2014), and the implementation will start in 2018 for the public sector and in 2020 for the private sector. During the EPISCOPE project the research team has divided the building stock of the CLDC according to the typology structure developed during the TABULA project, which was also applied in the division of the national building stock. For the pilot building stock, a building matrix was developed based on the typology and the chronological period of construction. Based on the building matrix the team has selected representative dwellings, which were both monitored and simulated in order to find their current energy performance. Through the monitoring, information was obtained for the energy performance indicators, the energy refurbishment trends and the energy consumption of the dwellings. 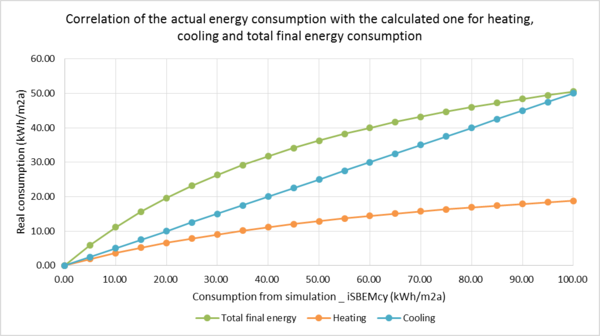 Through the simulations it was calculated the energy performance of the dwellings. By comparison of the actual with the calculated consumption, the correlation between them was found. From the comparison it is shown that the actual consumption is significantly lower from the calculated both for heating and cooling. (FIGURE 1). Figure 1: Correlation of the actual energy consumption with the calculated one. Further on, possible paths on how the CLDC may attain the minimum energy performance targets set by the Government Directives were determined, and feasible refurbishment strategies and techniques have been identified. Two main Refurbishment Scenarios, a Basic and an Ambitious (nZEB standards), have been developed. Representative buildings have been simulated with various alternatives for each Scenario, including different strategies on the thermal envelope, the heat supply systems and the renewable energy contribution in the existing CLDC's building stock. At a later stage, techno-economic studies (payback period, total investment etc.) were performed on the pilot stock, taking into consideration the correlation factor, in order to define the most cost-effective Refurbishment Scenario for each different building category. Also, for each building group an average building was calculated, representing the mean dwelling in terms of heated area, average area of the different envelope elements and mean U-value of the building envelope elements. Currently, analytical studies of various energy development scenarios of the CLDC pilot building stock have being carried out, based on the Refurbishment Scenarios developed on a previous stages and on the energy monitoring indicators from the monitoring process. The energy development scenarios aim to support and pave the way on applicable energy conservation measures that can be adopted in order to achieve the targets of the European Union as well as the national ones of reducing energy consumption and greenhouse gas emissions. The energy development scenarios are described by the depth and rate of energy refurbishment (TABLE 1) result to a set of summary indicators (TABLE 2) in order to have easily compared values among the partners. From the on-going energy development scenarios analysis it is concluded that if the targets are to be met, Deep Refurbishment (nZEB level) of the building envelope along with a turn towards renewable energy sources (PVs) for the energy production are needed (TABLE2). The Ambitious Refurbishment corresponds to low U-values of the building envelope elements, high efficiency electromechanical equipment and high percentage contribution of RES in the total energy supply, as shown on TABLE 1. TABLE 1: Description of Future Development Scenarios in terms of square meters, upgraded building envelope elements and contribution of RES in the energy production. Future endeavours include the development of an improved method of data collection and the use of the average buildings, as developed in earlier stage of the project, for the quicker and more effective development of various future energy development scenarios. These Scenarios aim at pinpointing the necessary energy refurbishment measures as well as their rate in order to achieve the national CO2 reduction targets.